National Geographic recently announced the winners of its “Nature Photographer of the Year Contest” for 2017. 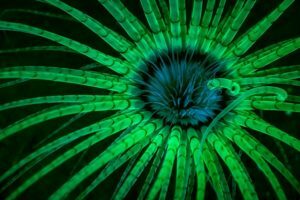 We were thrilled to see that a fluorescence image took 1st place in the Underwater category for the first time ever! Congratulations to Jim Obester for his striking image of a tube-dwelling anemone (Cerianthus sp.). To the left is his award-winning shot! To read more about the contest, Jim, and how he got the shot, see our “Info” article on the subject here!